Planting season is here and many fields are very wet. As producers watch the calendar, they'll be headed to fields that may be less than ideal for planting. 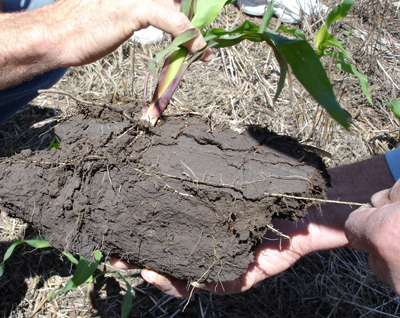 Wet soils are easily compacted and sidewall compaction during planting can be a problem, especially if the crop is "mudded in" and a dry spell occurs after planting. Patience is required for waiting for the soil to dry, but if the next rain is coming or the yield penalty for late planting is growing, it's hard to wait. Figure 1. These roots had difficulty penetrating the soil as the seeds were planted too shallow, only about 1 inch deep. The angled press wheels, designed for 2- to 3-inch planting depths, packed below the seed, forcing the roots to grow laterally down the seed-vee. Figure 2. The Schaffert* Furrow V Closer runs beside the seed-vee, caving in some loose soil for the press wheels to firm around the seed while closing the seed furrow. This loosened soil makes the seed-vee less likely to open up as the soil dries. Figure 3. This planter uses one Dawn* CurveTine on each row to close the soil around the seed and one standard press wheel to firm the soil while providing depth control. This reduces the aggressiveness of spoked closing wheels to reduce overdrying of the seed zone. Figure 4. 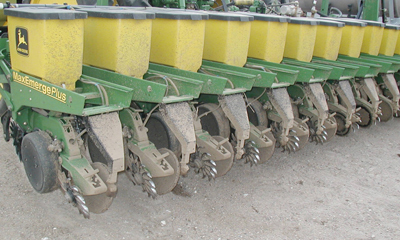 The seed furrow opener may smear the soil in wet planting conditions, but the closing devices should fracture the sidewall when closing the seed-vee. If not, the smeared soil may harden when it drys, making root penetration difficult. 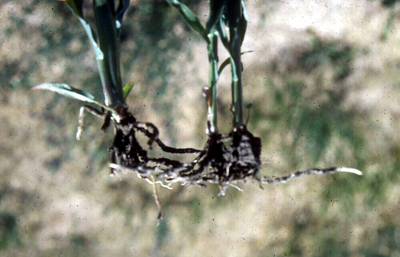 Many factors contribute to sidewall compaction. While wet soil is often given as the main reason, planting too shallow is the primary problem. In most conditions, corn seed should be planted 2 to 3 inches deep for proper root development. 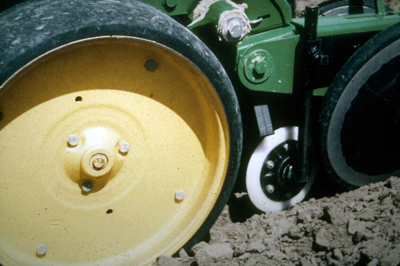 Most corn planters were designed for this planting depth, especially those with angled closing wheels. When you properly close the seed-vee, the sidewalls of the furrow should be fractured as the soil closes around the seed, eliminating the sidewalls and providing seed-to-soil contact. Most sidewall compaction problems on wet soils occur when the press wheels are set with too much downpressure, overpacking the seeds into the soil. When planting shallow, this press wheel compaction is below the seeding depth, making it difficult for the seedling roots to penetrate the soil (Figure 1). If you look at the angled press wheels from the rear, they intersect at an imaginary point about 2 inches below the soil surface. This provides seed-to-soil contact at seeding depth while closing the seed-vee. As such, downpressure on the press wheels should be checked at seeding depth, not at the top of the seed-vee. If the seed-to-soil contact is adequate, don't tighten the downpressure springs trying to close the seed-vee. Make sure that the planter is properly leveled, or even slightly tail down, for the angled closing wheels to have a pinching action to close the seed-vee. Seed-Vee Closers. A variety of attachments are available to help close the seed-vee if the standard closing devices can not. Some people use coulters or intermeshing row cleaners to till the soil in front of the planting unit to provide loose soil for closing the seed-vee. However, this loosened soil often sticks to the depth gauge wheels in wet conditions or the tillage dries out the seed zone in dry weather. A better way to provide loose soil for closing the seed-vee is to do it after the seed has been placed in the furrow. The Schaffert* Furrow V Closer does that in front of the standard press wheels (Figure 2).Spoked closing wheels, such as the Martin* Spading-Closing Wheels, May Wes* Poly Closing Wheels, Yetter* Close-Till System, Thompson* Wheel, Schlagel* Posi Close Wheels, Lofquist* Curved Spike Closing Wheel, Dawn* CurveTines, and several other brands are available to replace the standard press wheels with ones that till in the sidewall around the seed. (Attachments are roughly listed in order of decreasing aggressiveness). The less aggressive spoked wheels provide some seed-to-soil contact while closing the seed-vee and reducing air pockets around the seed. The more aggressive spoked wheels tend to dry the soil more and typically require a seed firmer to provide seed-to-soil contact and a drag chain behind them to level the soil. As the soils become drier and more seed-to-soil contact is needed, some producers remove the spoked wheels and put the standard closing wheels back on to reduce overdrying the seed zone. If the downpressure is set too high on some of these spoked wheels, they may "till" the seed out of the seed-vee. To reduce the aggressiveness of the tillage and to provide some soil firming and depth control, some producers run one spoked closing wheel and one standard wheel (Figure 3). This combination works well in a wide variety of conditions. While the seed furrow closing devices are important, too much downpressure on the depth gauge wheels will also create sidewall compaction as the disk openers form the seed furrow. The disk openers may create some sidewall smearing while pushing the soil outward to form the seed-vee. If there is too much downpressure on the depth gauge wheels, they will pack the soil downward at the same time, causing compaction that may be too dense for the closing devices to fracture (Figure 4). When this occurs, producers typically put more pressure on the press wheels trying to close the seed-vee, making the compaction around the seed worse yet. Downpressure on both the row unit (depth gauge wheels) and the press wheels should be reduced in wet soil conditions. Another contributor to sidewall compaction is the lack of soil structure in many tilled fields. Producers may put extra pressure on the closing devices to close the seed-vee when in wet conditions. Without soil structure, the standard closing wheels "pinch" the sidewalls closed over the seed, particularly in heavier soils. However, as the soil dries, it shrinks and the seed-vee may open back up, exposing the seeds. This often occurs when there is a hot, windy period after planting, drying out the seed zone and reducing the stand. This is less of a problem in higher organic matter soils and in continuous no-till soils with improved soil structure. If the angled closing wheels can be remounted, one in front of the other, this will reduce the pinching effect and compaction over the seed. If there is a dry layer on top of the soil at planting time and good soil moisture at planting depth, don't use residue movers or furrow openers to remove the dry soil because it has already shrunk. Also, when possible, leave residue over the row to reduce drying of the soil and protect the seed zone from raindrop impact. * Mention of brand names is for identification purposes only. Endorsement is not implied, nor is criticism intended of those not mentioned.